It's froggy cupcake time again at Wegmans. I know there has been a lot of questioning as to whether these even count as cupcakes. Okay not widespread controversy or anything....... okay so like one comment... but anyhow. I think they do count as cupcakes. Take a look inside. 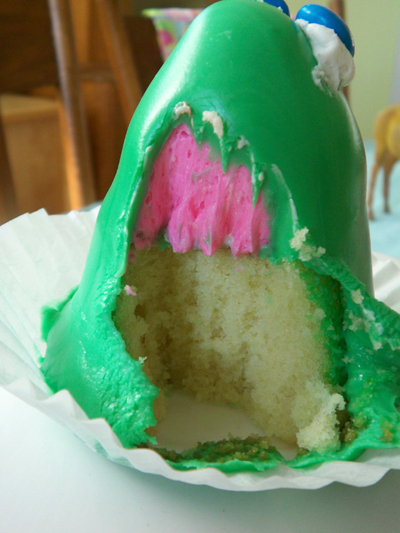 I chomped one open so you can see there is indeed cake inside with lots of pink frosting on top. Then green frosting is poured over the whole thing. Are you sure that is a frog, looks more like a pink brained alien of some sort. It looks yummy though,not too sure about all that green colouring yikes. 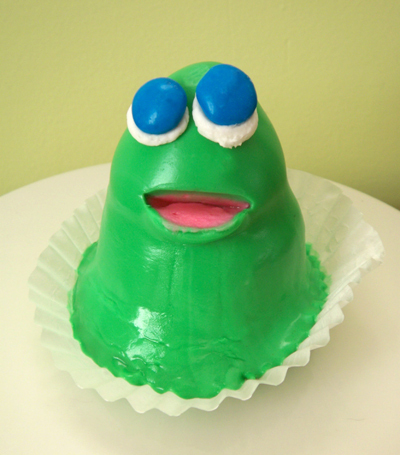 froggy brains = pink frosting? Good to know. Those are adorable! And perfect for leaping into Leap Day! Cute and all but me thinks biting into cute green frogs head only to be met with pink ooze is kind of...ummmm...alarming. that's not a frog...that's a blob. Those creep my husband out, but I always buy a couple when I see them for our little guys. Tradition, right? We get ours at Jackson's Bakery on Stone Rd. in Greece, where they are a bit cuter. So adorable! I might try to make those vegan-style! WOW! That's a lot of icing! Calorie overload! i wish we had wegman's here iin cali... i am missing out on so many goodies! These are adorable! I've always loved pink and green together. Hilarious!! I love the mouth cut thru to the pink underneath. What a great idea. Do you think they bake them without liners and then set the baked cupcake on the liner? Denise - I am so glad! The Wegman's frosting is quite yummy by the way. anonymous... I'm not sure how they bake them... maybe peel the cupcake liner off and place the cake on a fresh one? Today while at Home Goods I saw a cupcake candelabara, complete with dangling prisms and beads. I thought of you when I saw it!